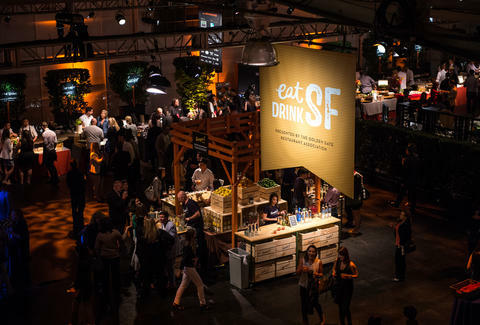 Because the best things in life are free, and the best free things in life are VIP tickets to two straight days of eating and drinking ridiculousness at one of the best SF food & booze festivals of the entire year, we're giving away exactly that: a pair of VIP weekender tix to 2015's Eat Drink SF (August 21st-22nd), which'll get you and someone who will owe you BIG TIME into all three grand tasting events (Friday evening, Saturday afternoon, Saturday evening) at Fort Mason. And because you'll be a VIP, in addition to being able to eat your way through food from more than 100 restaurants and drink your way through 70 beer, wine, and cocktail providers over the two-day span, you'll also be able to get in on VIP stuff like a special Champagne Collet bar in the VIP area, a Club Caravan Airstream ice cream parlor, and, most important of all, your very own private restroom (ohthankgod). And all you have to do to have a shot at winning the pair of tickets (assuming you're 21+, and super cool) is tweet THIS by noon PST on Friday, and we'll randomly pick a winner. Also, good news: if you don't win, you can still buy tickets like a normal person here. Grant Marek is Thrillist's Senior Cities Director and he's actually most interested in finding out what EDSF's "Cheese Monger Cave" is. Give him clues on Twitter at @grant_marek.